Last weekend I did some shopping. Well, mostly window shopping, as it is these days, but it’s always fun to look, right? First stop was Tuesday Morning…. 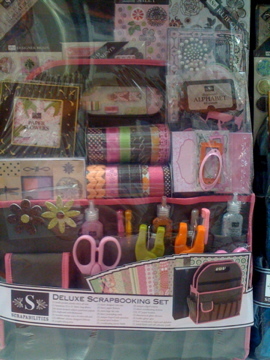 Lots of crafty storage, scrapbook embellies, and scrapbooks. MM Halloween paints, etc. 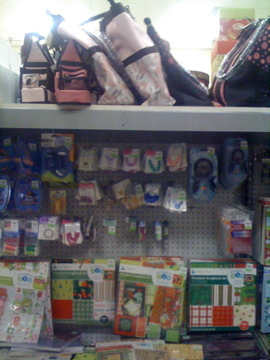 Those green rolling totes up top were cute, and I almost got that shoulder tote on the third shelf to use for a summer purse. It was a black/white print with some yellow and red…very cute. 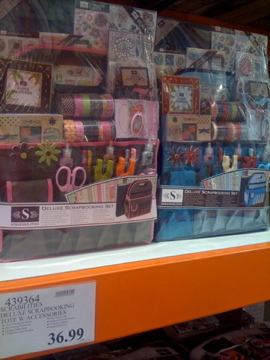 They still had some of the HEIDI SWAPP TOTES, small Tote-ally Cool Totes, and lots more scrappy stuff. 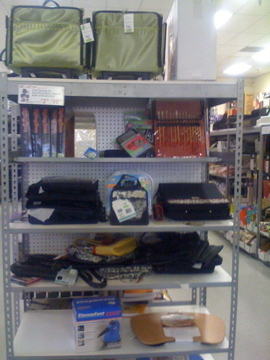 Even some blank canvases on the bottom shelf. These pre-done albums were SO tempting! 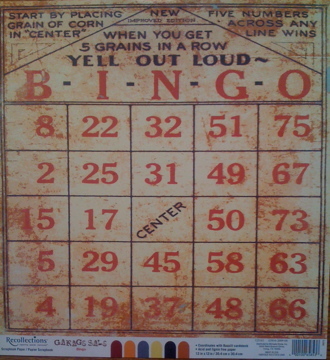 Both by Making Memories, the red one was Fa La La and 8×8; the blue baby one was 8.5×11. Both were the nicely embellished inside. 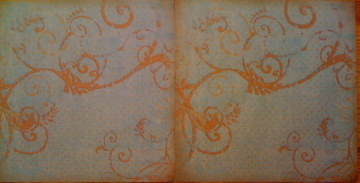 You could just pop in your photos, write some journaling, and be done. 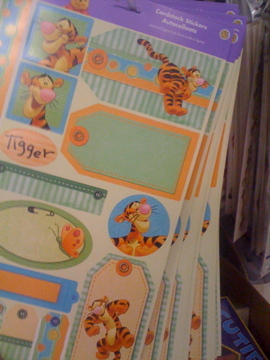 This was interesting…a huge pack of the SAME Tigger cardstock stickers. 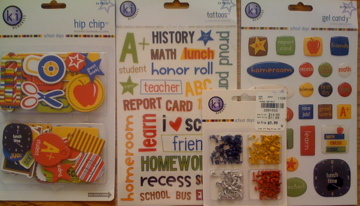 I guess $2.69 is a great deal but WTH would you do with all those stickers, LOL! ADORABLE rubber embellishments and chipboard journal spots by KI Memories. 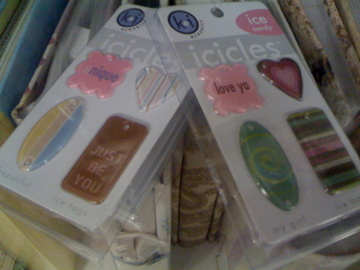 Yes, these were in my hand, too, but didn’t make the final cut either…. So, overall Tuesday Morning was decent. I got a few things (see the end of this post) for great prices. 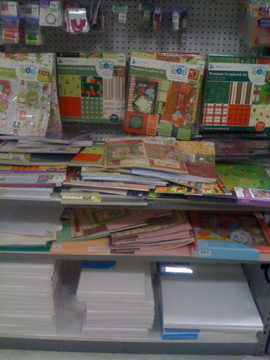 They had a lot of scrapbooking stuff out. 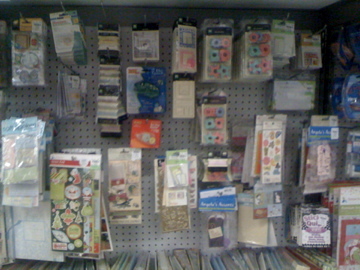 Next I went to Michaels. I didn’t bother taking pictures this time with my stealth iPhone, since I linked to all those photos in my last post. Suffice to say, TONS of new holiday and Christmas stuff, so it’s worth your while to make a trip. 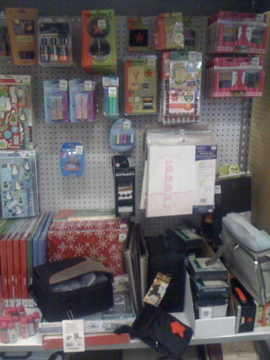 Again, see the end of this post to see what I got at Michaels….Oh, and apparently there is now a Halloween clearance SALE going on now. 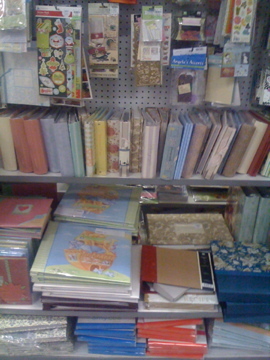 Last was Costco, which hasn’t had much in the way of scrapbooking stuff in a while but I always check just in case….you never know…. 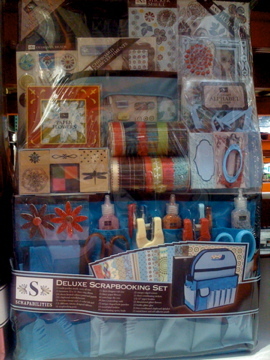 They did have two scrapbooking kits, I assume because Christmas is coming up. 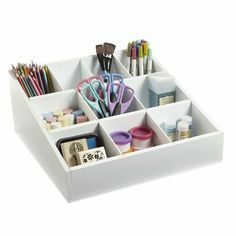 $37 and there were two choices….love the cute little holder it comes in. On my way home, I stopped at Barnes and Noble, planning to pick up the new December Creating Keepsakes magazine (the Peas said HERE that it had been out for a few days). Howevah! 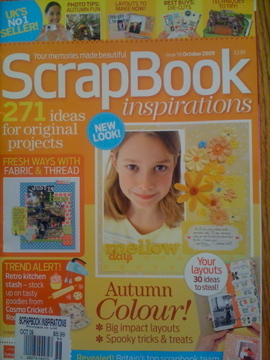 B&N did not have it, so I consoled myself with this British scrapping mag. The overseas magazines used to be much more expensive that US ones, but they cost about the same now, so why not? It’s fun to see their style and such across the pond. 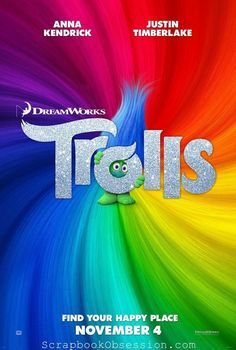 Plus, I love how they spell “colour”…..much more flair than plain old “color,” don’t you think? 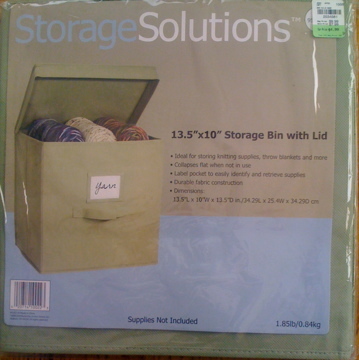 A pretty sage green structured cloth storage cube for $5 and…. 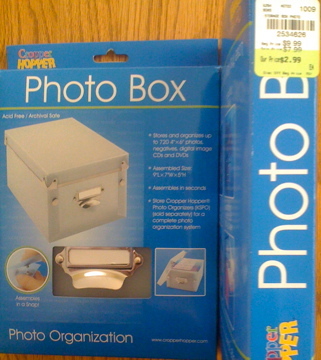 …2 of these Cropper Hopper photo boxes ($3 each) to help with my scrapbook room MAKEOVER. 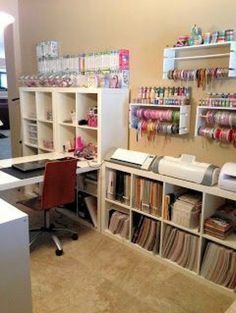 I’m going to store a bunch of mini-album supplies in the green cube, keep all that stuff in one place, out of the dust, and looking neater. 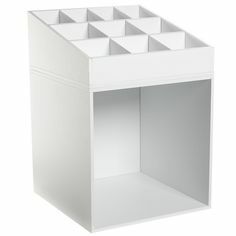 Not sure about the photo boxes but I already have a couple. I just know they won’t be used for photos, because I have another system in place for those. 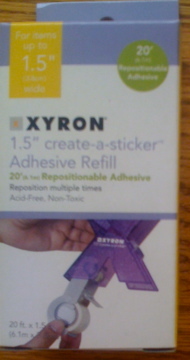 This was probably my favorite buy of the day….some KI Memories school embellies. I’ve wanted some of this line since way back HERE. 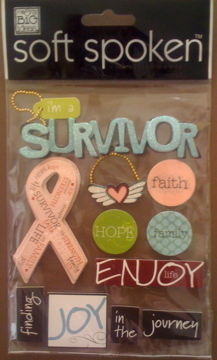 It was a great deal, too….all of this for only $4….WOW! Here are 2 of the newer papers by Recollections that I mentioned before…finally got me some! 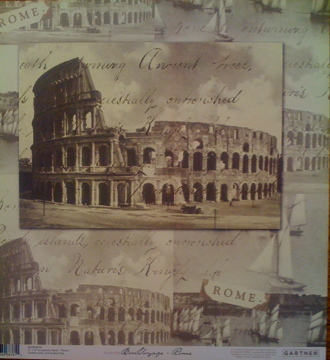 Gorgeous Rome paper for my Rome scrapbook…I was there at that same Coliseum, LOL! ALL of the open stock paper was on sale for 30% off (not just their usual sale of only the 69 cent papers), so it was a great day to get some specialty papers. So that was my latest shopping adventure! 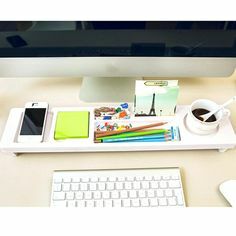 What have you found to buy lately? 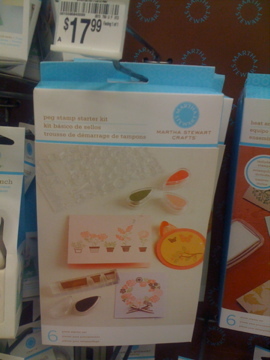 30% Off ALL Martha Stewart Crafts	Michaels, CK December, and Starcrack Strikes Again! 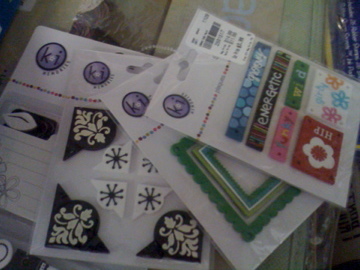 I had fun “shopping” with you…you know who is gonna love those stickers! Those 2 papers that you said would look good side by side for a 2 page layout…have you thought of turning one upside down…the design might look neat like that for a 2 page…just a thought. Lots of good window shopping, but looks like you snagged a few good ones to take home also. I did Mike’s yesterday and struggled to decide what to spend my 50% off coupon on. I got one from the Sun. paper and one from email. Also have one I got from a register receipt last week. So many I can’t afford to use them all! 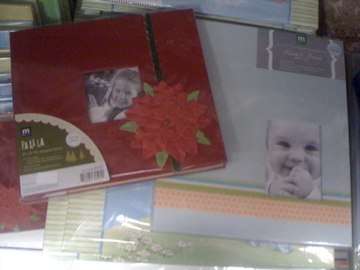 LOL Got some pretty paper 4/$1, some MM vintage Findings for 75% off and hm-m-m! can’t remember what I used my coupon for. Oh, yes, (don’t tell but I sneaked a look at my ticket!) 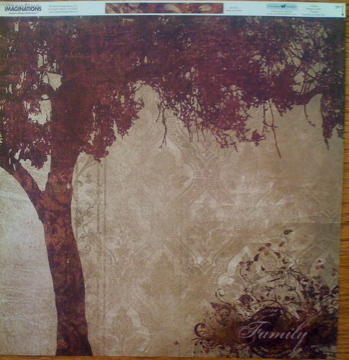 I got the BG calendar for 2010. Regretted not getting one last year. My sis’ was so pretty. 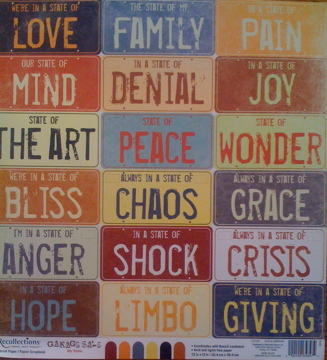 All in all, a good trip. 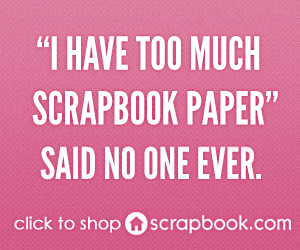 I so enjoy seeing the results from your shopping trips. I too had a little “me time” last night before my haircut/highlight/major hair overhaul. 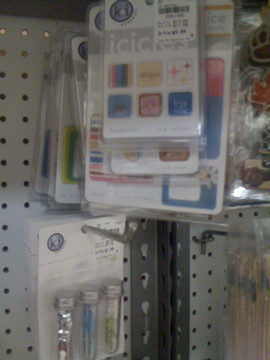 Found 3 different Cricut cartridges on clearance at Hobby Lobby for $12.95!!!! Very exciting, even if they were some of the old ones. I ended up getting Stamped and Printing Press because you can always use another font cartridge, right? Paper Pups was the third one on clearance but I already have that one.